Joe Reihsen, ''Great Expanse,'' 2013, acrylic on panel, 11 x 9''. Joe Reihsen's "Clean Title, No Accidents" presents a rich mystery for painters and painting lovers alike. Using a combination of airbrush (or a similar device using compressed air), frottage, and additional and secretive strategies to image making, this gathering of a dozen paintings ranging from one- to five-feet square provoke engagement as much for their cryptic process as for the results. The most effective paintings, such as "Body Double" and "Sleep Deprivation," limit their palettes to black and white backgrounds with hazy red-and-blue fields roughly in the shape of brushstroke silhouettes. 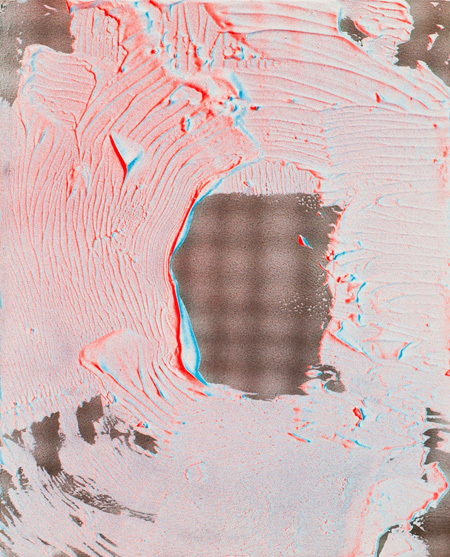 The red and blue are viscerally graphic in the mode of an old-school 3D dynamic, creating a look that feels as much like a high-resolution photograph or scan of a painting as an actual material object. The pinks, oranges, and greens employed in other works become a bit more distracting than they need to be, though the odd dichotomy of image and object still persist. To quote the show's release, "how the f- were these made?" I can't put it any better than that.